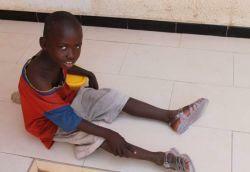 Projects Abroad Care volunteers in Senegal have been doing a great job in one of the local Talibé Centers. Noticing that the children’s feet were bare and injured Naomi from the US, Christina from Norway and Coby from Germany resolved to club together and buy some shoes. These volunteers have all been involved in healthcare programs at the center and have seen the wounds that the children have on their feet. The girls decided that investing in shoes for each of the children would not only allow their current wounds to heal, but would prevent this type of injury in the future. The children stood excitedly in line waiting to have their feet measured, and were extremely happy with the new shoes that they were given. Thank you very much to Naomi, Christina and Coby, for this thoughtful gesture, which makes such a difference to the lives of these children.